I’d never gotten to try little fish at their old location, but have been wanting to go to the new one for awhile. So finally, I went! Oh, this was right after my camera met a wet death, so unfortunately, all these photos are going to be a terribly lit and grainy cell phone camera mess. Trust me, all the food looks tremendous in person. But the place does have incredibly low “romantic” style lighting, so it’s not all the cell phone’s fault! As you can guess by the name, it’s all about fish and seafood here. The menu is small and changing. The place is teeny tiny. You must make a reservation. Those of you who’ve been to salt & pepper in their original location know how tiny it is. It was also ungodly hot out, and they don’t exactly have what I’d call ideal climate control. And we were sat at the table furthest back and closest to the kitchen. It all made for a warm evening. The old couple next to us, they had one of those fake ice gel packs that you put in coolers and lunch boxes and what not, and they were using it to cool their laps and handing it back and forth to each other during their meal. What a brilliant freakin idea! I wasn’t being super nosy or anything, it’s just that the tables are close, I couldn’t help but notice! Ok, onto the food. I was pretty starving so I was so happy when they brought the bread around. 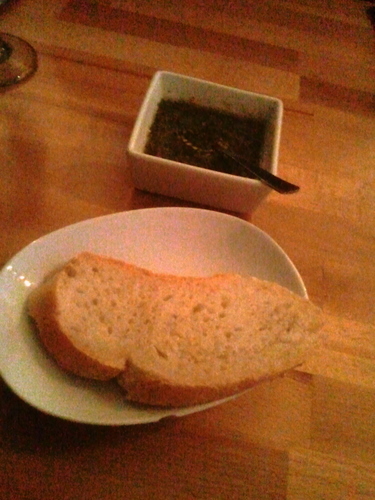 The bread itself is delicious, nice and crusty, but I absolutely fell for their herby pesto vinaigrette type thing they give you for dipping. It was super zesty and perfect for soaking up with the bread. Here’s the beet salad! 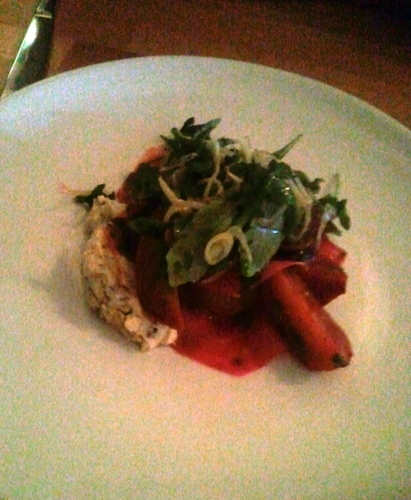 It had both red and golden beets plus fennel, sliced radish, creme fraiche, and pistachio. This thing was excellent! Especially because I love me some beets. And even if you don’t like beets, you should try it anyway! The most surprising bit of this was that the crushed pistachio nuts were in the creme fraiche, so that it was smooth and crunchy at the same time. I was facing the kitchen, so I had some extra fun watching the chefs prepare the food. As I’ve said in the past, I love open kitchens because it’s like dinner and a show! Here is the skate. It’s a pretty enormous helping of pan fried skate with polenta cakes, corn, chanterelles, pancetta, cherry tomatoes, and what I think is some cucumber thing at the top. This was definitely a winner. Now listen up. If you don’t like a fish that is actually fishy, then don’t get this skate. It definitely has a “I’m from the ocean” taste and smell to it, and that’s not a bad thing. It’s crispy on the outside and tender on the inside, and it’s cooked perfectly. And everything else on the plate was also delicious. 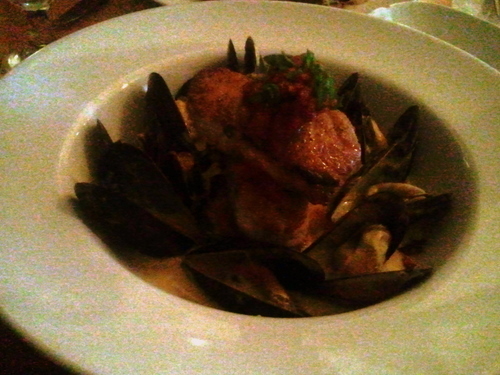 Here is my striped bass dish. There are two honkin pieces of perfectly cooked striped bass, topped onto potato zucchini hash, all sitting in a giant bowl of coconut curry broth swimming with mussels. It was also topped with some kind of tomato based relish stuff on top, which was amazing. Everything was so good! 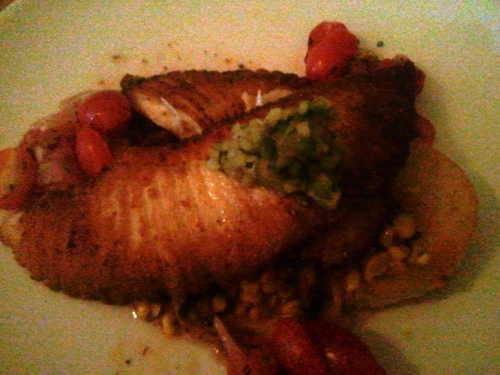 And may I repeat, the fish was perfectly cooked. There’s certainly no undoneness at all, but there’s absolutely nothing overcooked here either. It’s just right. I loved the hash, which was a mix of extremely thinly sliced potato and zucchini. It looked like that fancy ratatouille from that Ratatouille movie. And I don’t even like stuff made with coconut milk most of the time, but I loved this thick broth, which was rich and creamy. These entree portions were nothing to scoff at, there was plenty! 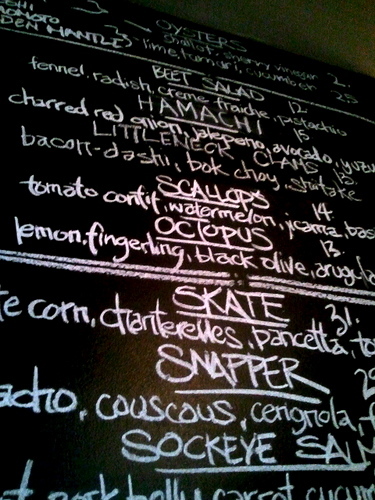 This place totally lived up to my expectations, and then some. Service was quite good. I can’t wait to go back, especially for their sunday prix fixe!